Are you in the market for a new SUV? Do you need something with tons of space for both passengers and cargo while still maintaining a sporty look and offering the latest technology features? Then you need to check out the new 2019 Hyundai Santa Fe XL! Lucky for you, we’ve got everything you need to know about the 2019 Hyundai Santa Fe XL, right here! 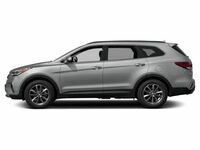 In 2019, Hyundai changed the naming conventions for its lineup, so even though there’s never been a Hyundai Santa Fe XL, it’s not a brand-new model from Hyundai. Rather, the 2019 Hyundai Santa Fe XL is what used to be called the Hyundai Santa Fe. The old Hyundai Santa Fe Sport is now just the Hyundai Santa Fe. It can be a little confusing, but don’t worry! What matters is that the 2019 Hyundai Santa Fe XL continues the tradition of the incredible value offered by the Hyundai Santa Fe! In this model research page, we’re going to break down everything drivers need to know about the 2019 Hyundai Santa Fe XL from its safety to its interior features and more! What’s always most important for any vehicle is safety. Especially with the 2019 Hyundai Santa Fe XL, with its seven-passenger seating being so popular among families, safety is the first and foremost priority. Drivers with families can rest easy with the 2019 Hyundai Santa Fe XL, though, with its high marks from the Insurance Institute for Highway Safety and National Highway Traffic Safety Administration. The 2019 Hyundai Santa Fe XL was named a 2019 IIHS Top Safety Pick and received a 5-Star Overall Safety Rating from the NHTSA. Once inside, drivers will find an interior that is as spacious and versatile as any other SUV in the 2019 Hyundai Santa Fe XL’s segment. In fact, the 2019 Hyundai Santa Fe XL’s total interior volume of 160 cubic feet beats out competitors like the Toyota Highlander and Mazda CX-9. Plus, the 2019 Toyota Hyundai Santa Fe XL has 31.5 inches of third-row legroom, also more than the Mazda CX-9 and Toyota Highlander, showing that no matter where you sit in the Santa Fe XL, you’ve got space! But drivers will find more in the interior of the 2019 Hyundai Santa Fe XL than just space. They’ll also find the latest features and amenities like heated and ventilated seats, Apple CarPlay and Android Auto Support and a Multi-view Camera System to make navigating tight areas even easier! Want to learn more about the 2019 Hyundai Santa Fe XL? Ready to get behind the wheel of one? Contact our staff at Broadway Auto for more information or to schedule a test drive today! Interested in a Hyundai Santa Fe XL?